While it sometimes gets lost in its own convolutions, this installment is brightened by some fine performances, particularly Honor Blackman as Cathy as Hilda, and Kenneth J. Warren (a.k.a. Z.Z. von Schnerk) as the mysterious "F."
Forgetting to close the door behind her, Julia Arnall (playing Hilda Stern) gives us a glimpse of a huge TV camera being wheeled through the set (third image). 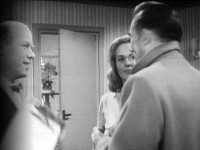 Some scenes were pre-recorded on 28 December 1962 in advance of the main recording (obviously not the one mentioned above). 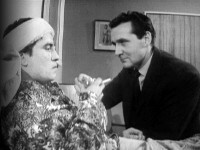 The camera script notes that this episode would air on Saturday 6 January 1963 on ABC and other regions, but in London on ATV (along with TWW, WTV and CHA) it would debut on Sunday 7 January. 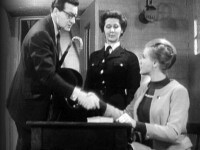 Television historian and author Andrew Pixley believes that this change in scheduling took place with this episode, and for the rest of the season the show's premiere was on ABC on the Saturday, with ATV London taking it the following night.